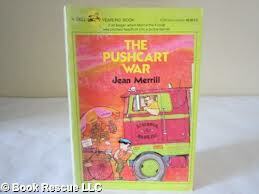 My pick for Day 4 of Children's Book Week 2013 is The Pushcart War (1964) by Jean Merrill. This book is an allegory about bullying before its time. It is funny and clever and instructive: might does not make right; bigger is not necessarily better; sharing is good; you are your brother's keeper; negotiating in good faith is next to godliness but compromise is not always the answer. The books begins, "The Pushcart War started on the afternoon of March 15, 1976 when a truck ran down a pushcart belonging to a flower peddler." You see, the "The Three" trucking companies have joined in an unholy alliance to eliminate traffic competition on the narrow streets of Greenwich Village. As Professor Cumberly tells us, "The truck drivers had gotten together and figured out that in crowded traffic conditions, the only way to get where you wanted to go was to be so big that you didn't have to get out of the way of anybody." The pushcart peddlers respond with a pea-shooter campaign involving pins inserted in the peas to flatten the truck tires. That way when the public begins complaining about the traffic bottlenecks the trucks will be sitting there, obviously the cause. One peddler, Frank the Flower, is arrested and takes responsibility for all 19,000 pea-shooter hits. Children and movie stars take sides. A driver for Tiger Trucking is fired for going over to the enemy. There is eventually a truce resulting in new legislation and Albert P. Mack goes to prison for violating said truce nineteen times. A statue of General Anna, one of the pushcart peddlers, is erected in commemoration. The Pushcart War won a Lewis Carroll Shelf Award and a Horn Book Fanfare Best Book award. It has been adapted for the stage by Young ACT Company in Seattle, turned into a musical and excerpted in elementary lit textbooks. Fun fact: The book is written as a report from the future, so every few years when the book is reprinted the date of the beginning of the Pushcart War is pushed forward several years, currently standing at 2029.